Originally from Nashville, Tennessee, Steve Sutton made his way east to Winston-Salem while growing up in the brass band tradition of the Salvation Army. Over the years, Sutton has performed with some of the most prestigious brass bands in the Southeast, including the Southern Territorial Band. He has also toured and performed as a soloist with brass bands throughout the United States, Spain, Brazil, and the Bahamas. Now as a freelance trumpet player, he regularly plays with the Winston-Salem, Greensboro, Roanoke, and Charleston Symphonies and has also performed with the Carolina Philharmonic. Steve currently holds the Eb soprano cornet chair in the North Carolina Brass Band and is a founding member of the Ardmore Brass Quintet. To pay tribute to his formative years, Sutton now serves as a conductor, brass instructor, and featured performer for the Salvation Army. As a Bandmaster for the International Corp., he conducts several bands including the Triad Brass, Carolinas Youth Band, and the International Corp. Band. Steve attended the University of North Carolina at Greensboro, where he received his Bachelor of Music degree in Trumpet performance. 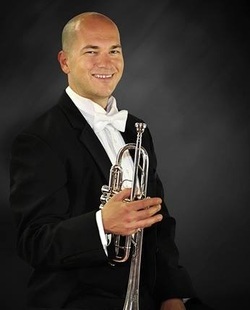 He continued his studies at the University of the North Carolina School of the Arts where he earned his Master of Music degree in Trumpet Performance under the instruction of Mark Niehaus, Ryan Anthony, and Philip Smith.